The Surgery Center of Centralia has added Orthopedic and Pain Management services with the addition of several new physicians. Please join us in welcoming them. Dr. Ahmed Salem Mohamed, M.D. is an Orthopedic surgeon with Egyptian Spine Clinic who specializes in spine surgery. He has 15 years of clinical experience in orthopedic surgery including complex spine deformities and scoliosis, degenerative spine disorders, spine infection, spine tumors and disc arthroplasty. You can find additional practice information at: www.egyptianspine.org. Dr. Jeffrey B. McIntosh with Neuromuscular Orthopaedic Institute is an Orthopaedic Surgeon that specializes in knees and shoulders. He graduated from John Hopkins University School of Medicine. His expertise is in the areas of joint pain, arthritis, pinched nerves, carpal tunnel syndrome and fractured bones. More information at: www.noimvn.com. Dr. Bernard Rerri is an Orthopedic Surgeon with over 20 years of diverse experience in orthopedic surgery and is an expert in minimally invasive spine surgery. His surgical services include carpal tunnel decompression, lumbar microdiscectomy, endoscopic laser spine surgery, lateral access lumbar fusions and more. Dr. Rerri has an offices in Centralia, Illinois and the surrounding area. The addition of pain management and orthopedic services at The Surgery Center of Centralia will allow us to continue to provide exceptional care to the community. April 2011 – Chattanooga, TN – Community Care, Inc. is excited to announce the opening of the CyberKnife of Chattanooga at Erlanger. This is a joint venture with Erlanger Health System and local Radiation Oncologists to provide CyberKnife radiosurgery services. 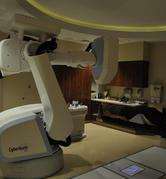 The CyberKnife is the world’s first and only radiosurgery system that destroys tumors. This center recently introduced new software to treat lung cancer patients. Please visit cancercanthide.com. 2011 – Mercy Health Partners has joined with Community Care, Inc. and the physician owners at Mercy Premium Surgery Center. This ASC is located at 5319 Hoag Road in Elyria, Ohio. The ASC will be relocated to the new Mercy Avon medical campus once construction is complete. Relocation to this new site is intended to provide physicians and residents of the community with a convenient option for high quality and effective outpatient surgical services.